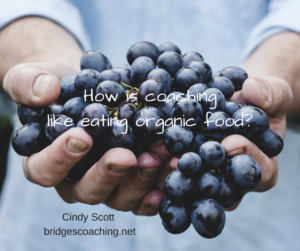 Three Ways Coaching Is Like Eating Organic Food! Talking with a couple coach trainees yesterday got me to thinking about how eating organic food is like coaching. Here’s some of my thoughts. Organic food by definition is pure. It has no additives or artificial interference. It is slow, you can’t rush it or grow it in a hurry and it has a different constitution than say, fast food. So, here’s the three ways that Coaching is like eating organic food. 1.Organic food is not what we naturally crave. I crave a soda and fries… but as I learn to listen to my body better I am finding that those cravings were a mask to what I really wanted and needed. In my spiritual life I crave someone just telling me what to do. I don’t really want to dig behind the mask to find out what is really needed in my life. 2.You probably can’t get organic food in a drive thru.